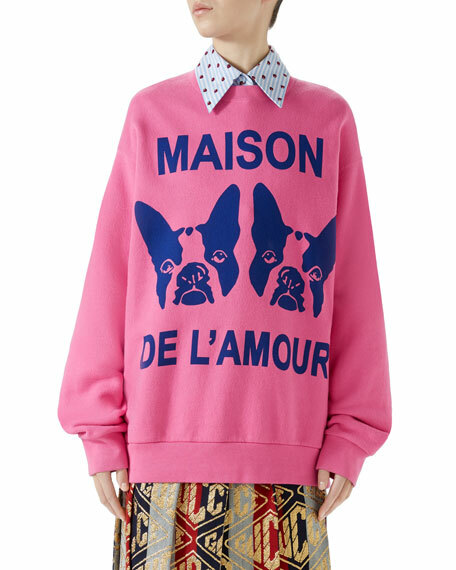 Heavy felt cotton sweatshirt with Orso & Bosco dog-print. Reads: Maison De L'Amour at front. Gucci sweatshirt in flora print heavy felted cotton jersey. Gucci 'Carte de Tendre' print. Crew neckline. Long sleeves. Oversize silhouette. Gucci sweatshirt in flora print heavy felted cotton jersey. Gucci 'Carte de Tendre' print. Crew neckline. Long sleeves. Oversize silhouette. Cotton. Made in Italy. 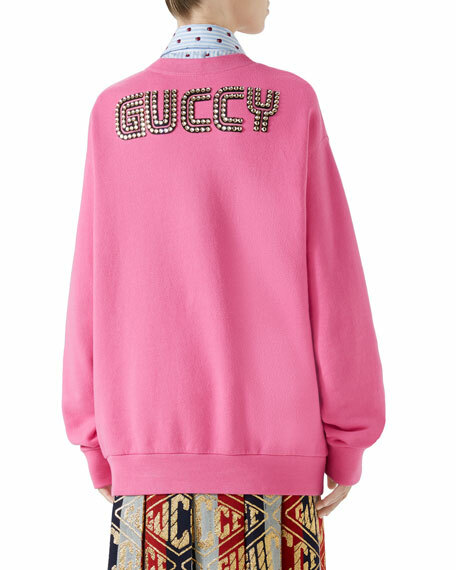 Gucci sweatshirt in heavy felted cotton jersey. "Gucci Homme pour Femme" patch with sequins. Hooded neckline; button closure. Horsebit print silk lining. Oversize fit. Cotton. Made in Italy. Gucci sweatshirt dress featuring vintage logo print inspired by the men's and women's ready-to-wear collections. Hooded collar with raw-edge, split detail. Long, raglan sleeves. Kangaroo pocket. Pullover style. Cotton. Made in Italy.